Published: Feb. 25, 2013 at 02:16 p.m. Updated: Feb. 25, 2013 at 03:50 p.m. While some of my Around The League colleagues spent the last few days in Indianapolis watching large men labor in Spanx, The Powers That Be sent yours truly to Hollywood to cover the Oscars. This was not a bad deal. 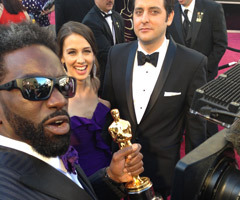 My job was to observe Ed Reed, the Baltimore Ravens safety who was flown in to serve as the red-carpet correspondent for the "The Rich Eisen Podcast." Rob Gronkowski originally was booked, but he pulled out late in the week. You'll have to wait for his 2023 autobiography, "Gronk Reading Book" (Simon & Schuster), for more details. It was disappointing to lose Gronk. After all, dropping that dude into the mad pop-culture vortex that is Oscar night had the potential to collapse the universe into itself. Reed was a solid replacement, though, and his breezy temperament served as a nice yin to the chaotic yang that raged around us on Hollywood Boulevard. I decided to document the afternoon in running diary form. All times are Pacific and only vaguely accurate. Everything else happened exactly as I say. 2 p.m.: We are in very tight quarters on the red carpet. Ed, his buddy Glenn, Eisen producer Chris Brockman, myself, a cameraman and a sound guy all traffic in the surface area of a phone booth. 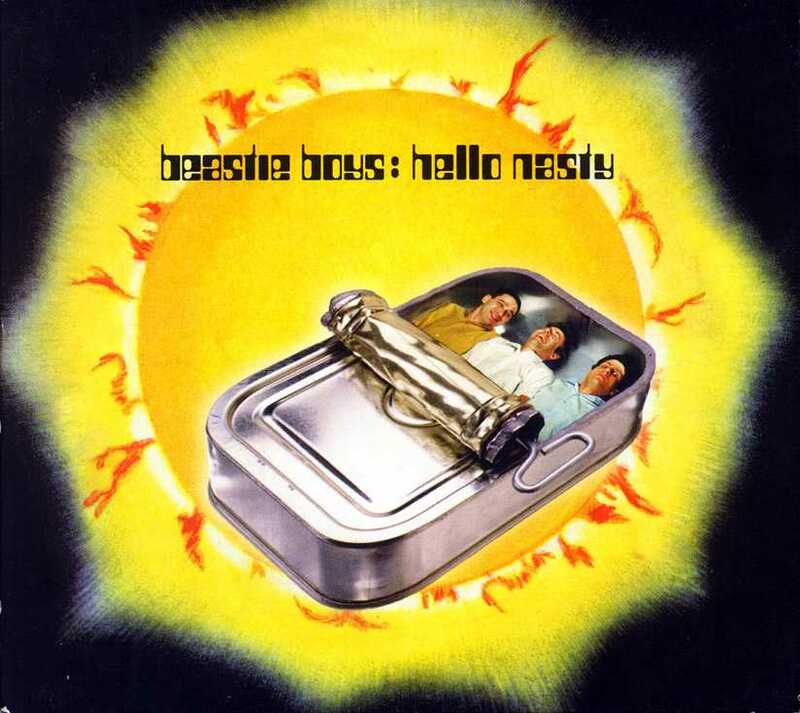 We're basically recreating the cover art from "Hello Nasty." Half of Gronk's right shoulder would've fit in this space. As my mom says, "Everything happens for a reason." 2:03: To our right are two 20-something women broadcasting live to China. To our left, several Spanish-language broadcasters with sharp elbows continuously scramble. It's a safe bet neither side is aware a Hall of Fame safety is in their immediate vicinity. 2:10: The red carpet is broken down into three distinct lanes. The far lane borders bleachers that house fans who roast in the sun and scream loudly when prompted by Chris Connelly. The center is an express lane. Look at it like an E-ZPass for A-listers. We're on the other side of that. 2:20: A man and woman stroll the carpet showing off an Oscar statue. This is the totality of their job. Ed (we're now on a first-name basis) now has held the Lombardi and an Oscar in the same month. That's a solid February. 2:37: We have an alarming number of older men wearing toupees here. We're talking some seriously lush rugs. It's like an Uncle Lewis from "Christmas Vacation" convention. 3:00: The bigger celebs are arriving. Ed chats up the star of "Life of Pi" (No, not the tiger. It's a kid named Suraj Sharma). Sharma easily earns the award for the Celebrity Who Has Most Obviously Never Heard Of Ed Reed Before. 3:08: Did you know Chris Pine and Chris Evans are two different people? I'm serious. One Chris walked by, then the other one followed about 30 seconds later. 3:15: Ed briefly chats with "Avatar" star Zoe Saldana. He ends their conversation by telling Saldana to say hi to Nia Long for him. It's not clear why. This is why Ed Reed is the best. 4:13: "Bridesmaids" star Melissa McCarthy just iced us. Made eye contact and kept walking. This will not be forgotten. 4:23: Charlize Theron takes a narrow lead over Jessica Chastain and Olivia Munn as the actress whose on-screen hotness best translates in-person. Surely this is her greatest achievement. 4:24: Speaking of Charlize, Reed can't figure out how he knows her until his buddy Glenn mentions "The Legend Of Bagger Vance." Later, a visit by Don Johnson prompts a "Tin Cup" reference. 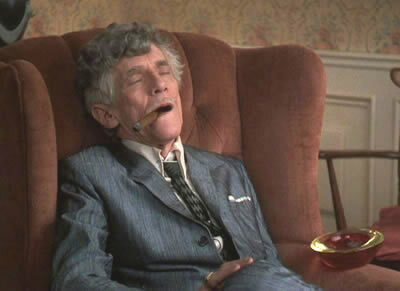 Who knew Ed Reed was such a cinephile in matters of the fairway? 4:35: Remember how perturbed Tommy Lee Jones looked at the Golden Globes? Well, the Surly Meter is cranking again on the carpet. 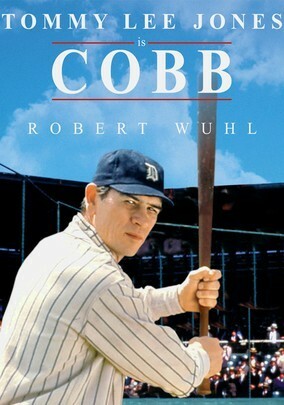 It's like he's method acting for that long-awaited "Cobb" sequel. 4:38: Halle Berry floats past us. She looks radiant and appears not to be a day over 30 (she's 46). She's basically the Hollywood equivalent of Tony Gonzalez. Having seen Berry in the flesh, Ed feels complete. "Yo, we good. We good to go. Let's go." 4:58: "Django Unchained" star Jamie Foxx takes the express lane. Ed is upset. Ed counted on having some QT with Foxx. Says Ed: "Django 1 needs to meet Django 2!" 5:00: "Twilight" star Kristen Stewart just chugged through the express lane on crutches. It was weird. 5:03: Ben Affleck books -- seriously, he's almost running -- right past us. He's clocked (unofficially) at 4.24 seconds. Chris Johnson is nervous. 5:09: Now things really are heating up. Steven Spielberg just took the express lane. I briefly made eye contact. I think he now owns me. 5:12: Grizzled red-carpet veteran Robert DeNiro takes the express lane. Jennifer Aniston, Dustin Hoffman, Michael Douglas and Catherine Zeta-Jones all will do the same. 5:15: Former Ravens cheerleader Stacy Keibler spots Ed and gives him a big hug. This is especially fortuitous for us since Keibler's boyfriend happens to be that George Clooney guy. 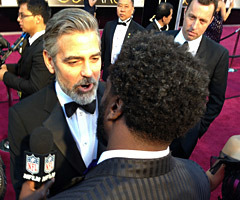 Clooney approaches Ed, groans and says, "You hurt me bad. I'm a Bengals fan." 5:20: The red-carpet portion of the Oscars is over. Ed and his buddy find a security guard with a Ravens allegiance who gets them inside for the ceremony. I walk to a gas station, where I catch a ride back to the office. The difference between Ed Reed and myself never has felt so stark. 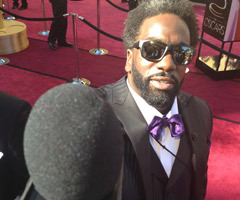 Check out more of Ed Reed at the Oscars on "The Rich Eisen Combine Special," which airs Wednesday at 9:30 p.m. ET on NFL Network. Follow Dan Hanzus on Twitter @DanHanzus.